Under the Carolina Moon is a unique gift boutique featuring Lilly Pulitzer, Kate Spade, Mud Pie, Natural Life, Corkcicle, Duke Cannon, Tervis Tumblers, and much more! Originally known as Carolina Girl Apparel, our story began in 2006 with owner, Angel Rice, selling t-shirts out of the trunk of her car to raise money for adoption. Three adoptions and 11 years later, Under the Carolina Moon is home to six exclusive Southern lifestyle t-shirt brands: Southernology®, Ashton Brye™ Collection, Livin' the Shore Life®, Because of Grace®, Rugged South™ and Under the Carolina Moon®. These shirts pair Southern sayings with hand-drawn illustrations to represent everything we love about the South. All shirts are designed and printed in house. 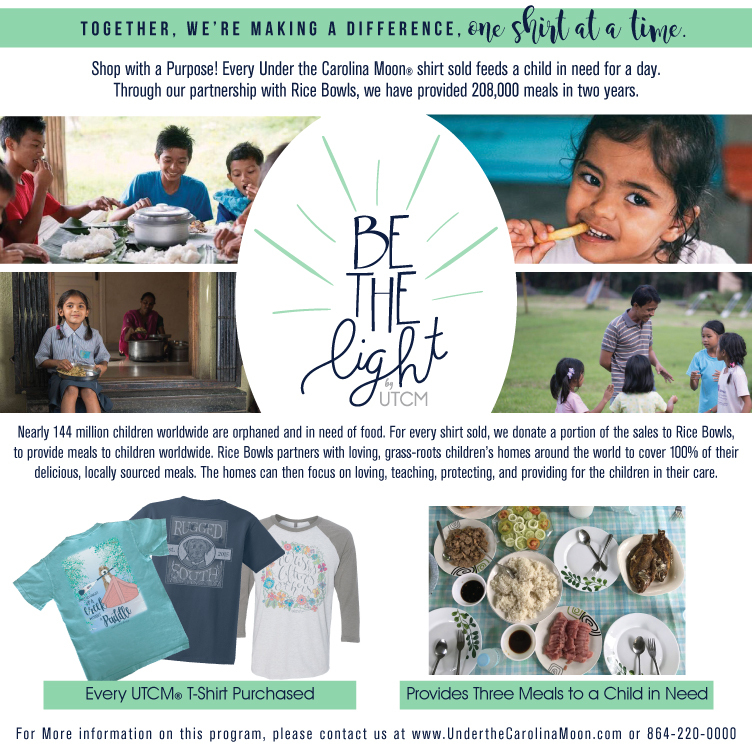 Through our Be the Light program in partnership with Rice Bowls, every retail shirt sold in our store provides three meals for a child in need. With your help, we've donated 208,000 meals in two years to help fight world hunger. We also offer other products with a purpose, such as Bridgewater Candles, benefitting Rice Bowls, and Duke Cannon, benefitting U.S. veterans. When you shop with us, you shop for good! In addition to our t-shirts, we also offer jewelry, gifts for the home, and preppy monogram apparel ensuring that we have something for everyone Under the Carolina Moon! Please note that we receive hundreds of emails daily. If you do not receive a response within 24 hours, please send your email again. We make every attempt to answer all emails within 24 hours. Phone: (864) 220-0000 or (800) 948-4328 during normal business hours. Stock items are shipped within one week upon your order being placed. Custom orders are shipped within 10-14 business days. If you need an item in a hurry, please contact us at angel@underthecarolinamoon.com or by phone at (800) 948-4328. Due to the nature of personalized gifts, anything personalized cannot be returned and all sales are final. All items are un-worn, un-washed, un-altered and have original tags still attached. All items are received within 30 days from the original purchase date. If you receive incorrect merchandise or merchandise you believe to be defective, please contact Customer Service at (800) 948-4328. All claims must be made within 30 days of purchase. Credits will be issued in the form of Store Credit ONLY. If your return does not meet the above criteria, do not attempt to return it, as it will be rejected by our returns department. To return an item by mail, please fill out the return form that was included with your order. Also, we suggest that you send items back via USPS, UPS or Fed Ex along with a tracking number. We are not responsible for items lost while in transit to us. Once we receive your order, it will be processed in 1-3 business days. You will be issued a store credit for the price of items and any applicable taxes. Shipping charges are non-refundable. Please note: Once an order has been placed, it cannot be canceled and items can not be removed from order. If you would like to change the size of an item, please contact us at angel@underthecarolinamoon.com.